Jaiman, Land of Twilight is an epic fantasy sourcebook for the Shadow World setting for Rolemaster, written by Terr Kevin Amthor and published by Iron Crown Enterprises. Jaiman, Land of Twilight is the latest sourcebook delving into the details of the Shadow World setting for Rolemaster. 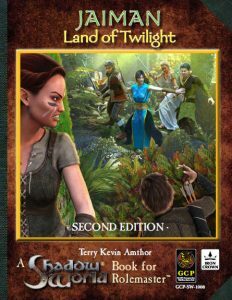 Much like its predecessor sourcebooks, it is a highly detailed sourcebook of the next region within the epic fantasy Shadow World setting. You will learn all about its climate, inhabitants, history, and politics along with sifting through a full gazetteer and plenty of adventures. Unlike the other Shadow World books reviewed by Roleplayers Chronicle, you also get an NPC and bestiary collection. Shadow World is in itself a collection of content for players and GMs alike. However, sometimes the sourcebooks are a lot more valuable to GMs than they are to players; Jaiman, Land of Twilight is one of those books. It does not contain a collection of new cultures as they appear to be some of the more standard ones available in Shadow World and possibly Rolemaster. It also does not contain a bunch of player goodies nor does it contain a narrative introduction and overview to set-up the fluff of the setting. Instead, it’s an adventure location. Its design is not so much meant to be a delve into new background opportunities for characters and fluff enhancements of their history before becoming adventures, it is a place to go where incredible adventures can be had. This is evident in the lengthy gazetteer, numerous adventures, and more importantly, the short campaign it details. That’s the power of this sourcebook in that its a GM destination with plenty of opportunities already fleshed out. 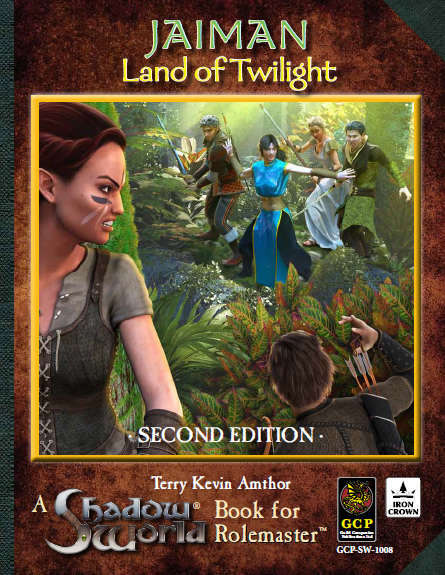 Now in its second edition, Jaiman, Land of Twilight follows the same presentation as the recent Shadow World books, creating a great-looking collection of sourcebooks. It contains a collection of old and new artwork with great maps and lots of descriptive setting detail. For GMs, it will not disappoint!